An ecosystem is a biological community of interacting organisms and their physical environment. It includes all of the living things interacting with each other and non-living environments (weather, earth, sun, soil, climate, atmosphere) in a given area. In an ecosystem, all species rely on each other and each organism has its’ own niche or role to play. A keystone species is a plant or animal that plays a disproportionately large role in the ecosystem – impacting both the prevalence and population levels of other species within their community. A keystone species is often, but not always, a predator. Outnumbered greatly by their prey, predators can control the distribution and population of large numbers of prey species. Wolves are a critical keystone species in a healthy ecosystem. By regulating prey populations, wolves enable many other species of plants and animals to flourish. In this regard, wolves initiate a domino effect – “touching” songbirds, beaver, fish, and butterflies. Without predators, such as wolves, the system fails to support a natural level of biodiversity. The recovery of the gray wolf after its eradication from Yellowstone National Park, nearly a century ago, serves as a demonstration of how critical keystone species are to the long-term sustainability of the ecosystems they inhabit. In the 70-year absence of wolves in the Park, elk had become accustomed to grazing tender, native willows along stream banks without much predation risk. The consequences of an elk population without a top predator included a decline of the deciduous trees elk eat, a decline of beavers due to the decline of willow and aspen, and a decline in songbirds. These consequences indicate that changes in the wolf population have trickle-down effects on other populations, a phenomenon known as a “trophic cascade”. With the support of the American public two decades ago, the federal government gave the green light to return wolves to portions of their native range in the West in 1995 and 1996 – including Yellowstone. The wildlife conservation event opened a new chapter in Yellowstone’s history, with a homecoming that changed the Park. 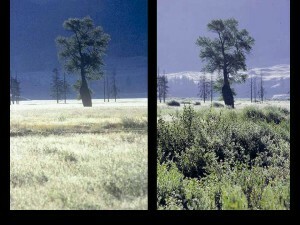 After wolf reintroduction, scientists documented the return of willows and other vegetation. And where the willow returned, the researchers noted more diverse wildlife. Beaver dams and dried up wetlands returned, and wetland birds, waterfowl and other wildlife thrived again where they had been suppressed for decades. Over-grazed grasses flourished anew on upland prairies. So without keystone species, ecosystems can be dramatically different or cease to exist altogether. Ecosystems are complex and the reintroduction of wolves to Yellowstone might be far more complicated and nuanced than can be explained by trophic cascade. Trophic Cascades in the Yellowstone ecosystem have to do with a variety of environmental conditions including fire, wolf densities, human hunting of wildlife, weather patterns, stochastic effects, etc… Research done in all sorts of systems – from coral reefs to rain-forests to the rocky inter-tidal zone to lakes – shows the complexity of these relationships and demonstrates that there are situations where a keystone may be present but not driving a strong top-down effect. It is important to remember that we do not live in an exclusively top-down or bottom-up world. We live in a world in which these effects work together to structure plant communities. The wolf is a very powerful player in this, but is not the only factor that affects ecosystem structure and function. Context matters. While wolves definitely initiate trophic cascades that improve ecosystem function, wolves are not a panacea for all that’s wrong in an ecosystem. This being said, wolves are an essential component of healthy ecosystems and thus should be conserved. To do anything other than that is really foolish, given all that science has taught us.